1.1. Sustainable development is development that meets the needs of the present without compromising the ability of future generations to meet their own needs. 3. SYSTEM THINKING A system is a set of interacting units with relationships among them; this implies that concentrated on the human behavior, the understanding of the drivers of environ- mental awareness gives insight in the conflicting drivers which prevent sustainable behavior. 3.1. Practical applications of system thinking lead to criteria for making a sustainable design. 4. INDUSTRIAL ECOLOGY Can be seen as the scientific part of sustainability as it studies the metabolism of industry, as a part of ecology, and in terms and in line with ecology. 4.1. Ecological systems provide many insights and tools to analyze industry, such as metabolism, but also emphasize the many relationships between elements of the system. 4.1.1. The knowledge provided by the analysis of IE will be of help to obtain a full description of the context of the design and make a proper assess- ment of the design result. 4.1.2. An important objective of IE is to under- stand by modeling these interrelationships and to research how to minimize waste and improve material and energy usage. 6. The sustainable designing process is different because a holistic sustainable development view is kept in mind in all design steps and stakeholders are actively involved. 6.1. The breakdown of the innovation path from idea into stages, the first measure, uses gates in between the stages where a decision is taken to stop the project or to go to the next stage. 7. A product innovation company for instance may want to insert an extra stage in the front end to focus first on linking local market needs with product functions. 8. Radical innovations contributing to sustainable development often means innovations across company fences. 9. GOAL DESIGN The goal of the new design should be clear to the designer. In general, the goal of the design is a simple statement (and all other requirements are stated as constraints). 10. 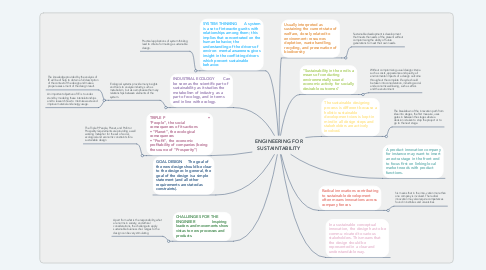 CHALLENGES FOR THE ENGINEER Inspiring leaders and movements show vistas to new processes and products. 11. In a sustainable conceptual innovation, the design has to be commu- nicated to various stakeholders. This means that the design should be represented in a clear and understandable way.